Voluntary muscles or striated muscles are those which work according to the one’s desire or are under control, whereas Involuntary muscles are not under one’s control. Biceps muscles, respiratory, alimentary and urogenital tracts are the places where voluntary muscles are found, while abdominal muscles, locomotory muscles, middle ear muscles, Diaphragm are the examples of the involuntary muscles. Locomotion and movement are the main features of the organisms, whether it is unicellular or multicellular. For this action, there is the particular type of tissues known as muscular tissue, and the cells are referred to as the muscle cell. These muscular tissues are formed from the embryonic mesoderm. These tissues are coordinately working with one another and thus support the movements of the body, and its various parts. In the provided article we will be studying the basic difference between the two types of muscles and a brief description of them. Also known as Striped, striated or skeletal muscles. Unstriped, non-striated, plain muscles. Shape Long, cylindrical and unbranched. Small and spindle-shaped. Type of cell Multinucleate. Uninucleate. Presence of nucleus The nucleus is present at the rim (Periphery). The nucleus is centrally placed. Sarcolemma It is thick. It is thin. Contraction is under the control of Central nervous system. Autonomic nervous system. Type of contractions Powerful and rapid. Rhythmic and slow. Energy requirement Require high energy. Require low energy. ciliary muscles. They are present in the walls of internal organs. Muscle fatigue Get fatigued easily. Fatigue slowly. Functions They are under the control of our will. They are not under the control of our will. They get tired and need rest at regular intervals. They do not get tired and can work continuously. Voluntary muscles occupy around 40% of the body weight. They are the under the control of the peripheral and central nervous system. The striated or skeletal or striped are the other names of the voluntary muscles. In the body of an individual, these are found in the bundles of muscle fibers. These are long and are present near the bones. The bundles of muscle fibers present are bounded by the sarcolemma, which contains sarcoplasm, sarcoplasmic reticulum, and are uninucleated. The entire muscles are covered by the epimysium, which is the kind of connective tissue. Each end of the muscles is attached to the bones, through the tendons. There are dark, and light bands present between each running fiber called as myofibrils. (i) As it is said, muscles fibers are the thread like, unbranched, and cylindrical, their range varies from 1mm to 30 cm. (ii) Sarcolemma – It has two layers – Plasma membrane, and basement membrane. It is a transparent membrane, and it surrounds the muscle fibers. (iii) Sarcoplasm – It resembles the cytoplasm of the cell, and as it is present in the muscle fiber, it is called as sarcoplasm. (iv) Syncytial – Below the layer or sarcolemma, nuclei are present, these are oval and flat in shape. (v) Sarcosomes – Apart from nuclei, cytoplasm, there are many types of enzymes, fat drops, and also mitochondria or sacrosomes, also endoplasmic reticulum or sarcoplasmic reticulum, golgi bodies, and other organelles. (vi) Myofibrils or sarcostyles – There are many parallel expanded thread like rods, in the sarcoplasm of muscle fibers. This rod-like structure is called as myofibrils or sarcostyles. Due to this the contraction and relaxation of the muscles are possible. Also known as unstriated or unstriped muscles. They are also known as visceral muscles as they are present in the walls of internal organs like urinary bladder, uterus, alimentary canal, etc. They are not under the control of one’s desire called as involuntary muscles. The cells of muscles fibers are long, thin and spindle-shaped, though structurally very simple. There is oval nucleus present in the center of each cell. The nucleus is surrounded by the sarcoplasm. There are long, thin, parallel filaments present in the sarcoplasm is called as myofibrils. These muscles do not show dark and light bands, although actin and myosin are present. Voluntary muscles are also known as striped, striated or skeletal muscles, whereas Involuntary muscles are also known as unstriped, non-striated, plain muscles. Voluntary muscles are long, cylindrical and unbranched, while Involuntary muscles are small and spindle-shaped. Voluntary muscles are multinucleate, and the nucleus is present at the rim (periphery). Involuntary muscles are uninucleate and the nucleus is centrally placed. Sarcolemma is thick in striated muscles, whereas it is thin in unstriated muscles. The muscles of voluntary muscles contract very rapidly and powerfully, and the contraction is under the control of the central nervous system. In the case of involuntary muscles, the contraction is rhythmic and slow, and the contraction is under the control of the autonomic nervous system. Involuntary muscles, the energy requirement is high, but it is low in involuntary muscles. Voluntary muscles are found in organs performing voluntary movements like locomotory muscles, tongue, pharynx, diaphragm, middle ear muscles, sheets of muscles of the abdominal wall under the skin. These are attached to the bones. On the contrary Involuntary muscles organs performing automatic movements like urogenital tracts, alimentary tracts, respiratory tracts, ducts of glands, blood vessels, ciliary muscles. They are present in the walls of internal organs. An intercalated disc is absent in both types of muscles, and the muscles get easily fatigued by the voluntary muscles, though the muscles fatigue is slow in involuntary muscles. Voluntary muscles are under the control of our will, they also get tired and need rest at regular intervals. On the other hand, Involuntary muscles are not under the control of our will and even not get tired and can work continuously. We discussed the voluntary and involuntary muscles, and their importance also. 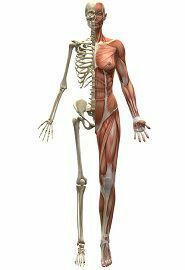 We also found that both the muscular system is not only required for the movements or locomotion, they also protect the body from external shock. Thus these are important for the body.